Yes. I haven't printed some in a while, but I also use the art on TTS. It's not that expensive, you can get over 100 cards for 40 bucks worth of ink. You might be able to get 200 but I don't want to make outlandish promises. Sounds good. I would like come in and finish with the nicer versions at some point, because there are a lot of cool cards I'd like to test. Honestly though, your cards are a lot of work. And I've alredy started working on the next expansion after Civilization, since it's gonna need a LOT of playtesting. FYI Fountain Gargolye doesn't need the looter type, look at vagrant. 100 cards as in 100 different cards with 10 each, or 10 piles of 10 cards each? If it's the latter, then it's out of my price range. I just listed the looter type for Fountain Gargoyle as a joke. Definitely don't include it if you mock it up. -I find cards on the Forum, or make them myself, and I get one copy as an image. -I use an OpenOffice Draw sheet to arrange the cards in a 2 x 4 block, after resizing them all to 2.25 x 3.5 inches. -I print out the 8-card sheet on a semi-gloss photo printer paper, at medium quality in full color. -I cut out all the 8 cards and affix them to a regular dominion card (usualy from my old base cards). -In games, I put the card above a pile, with 10 blank cards beneath them (8 for victory cards). I have 6 piles of 10 blank cards, each with a different symbol. -When you buy a fan card, you take a blank card from the pile beneath it. -When you play a blank card, you look to see what pile it symbol correspons to, and play it as the designated card from that pile. So long story short, I print out 1 copy in full color, and use it as a place holder. 59mm x 92mm is not a format every printing company supports but there is one, I am happy with the quality and a single card cost less than 0.20€. Of course you run into the issue of having to scan the backs and the printing result of the backs not perfectly matching the look of the backs of official cards such that you can actually tell whether a fan card is on top of your deck if you really look ... but if that isn't an issue to you fully printed fan cards are only moderately more expensive than official cards. Adversity by Multitalented! Please see the OP! Plauge by Plasticbrain! Please see the OP! More Cards! Please see the OP! Looks fantastic, Theta! My favorites are Templar and Spellbook. I think dying village should have its wording changed a bit. At first it seemed to be strictly better then Laboratory. It's a lost city, then lab, then moat. Templar is great and spellbook works best with other cards, or with Asper's Research. I embrace that you are crediting the authors now. Here's a bit of feedback on your changes. Your art picked for Swamp is an improvement - or rather, it looks just as good, but makes more sense, thematically. However, if I ever decide to change the name, I'll let a little more effort go into it than just take your's - after all, Capitols are a bit too modern for Dominion in my book. "Capital" would have been nice, if it wasn't already taken. Maybe something that has the same connotation, but fits the time. I'm open for suggestions there in my thread. Either way, Swamp's always been a bit unimaginative for a Landmark, so I'm not sure it'll stick around, after all. Your art for Farmer is rather nice. It's not crazy beautiful, but it's an improvement over my original pick and goes with Cornucopia's "If in doubt, depict women"-theme. If you were willing to tell me the source, I'd consider exchanging it when I have time. I still think my image for Scientist is better than the one you picked - I simply believe it fits the style of the game better. At the very least, it really didn't need replacement. Edit: Wow, I just noticed you even added my expansion symbol on my cards. Fancy that. I'll link the art for Farmer. Capitol seems no more modern then Scientist or Royal Blackmiths glasses or a lot fo guilds. Glasses go back to the 13th century. A Capitol in the meaning you use for the card didn't exist before the 18th century. Also, art isn't that big a thing compared to a card name. An anachronism slipped in Philosopher's Stone's art in that the lock on it didn't exist in the medieval ages. However, nobody ever lines out Philosopher's Stone as an anachronism, because the card's theme isn't one. This applies to a lot of Dominion cards, of course. I can imagine Groundskeeper as fan art for "Desperate Housewifes", but not as art for a medieval game. In fact, both of the artist's contributions to Empires are as pretty as they are unfitting. I really wish they weren't that way, but at least they're not named equally improper. I mean, I would have generally discouraged Donald from pursuing a "Roman" theme in Empires, too, but that's beside the point. Let's just say I'm pretty sure there's an option that's better than both Capitol and Swamp. Your art picked for Swamp is an improvement - or rather, it looks just as good, but makes more sense, thematically. ... Capitols are a bit too modern for Dominion in my book. ... Maybe something that has the same connotation, but fits the time. Already replied to this, but apparently my post didn't go through. I thought about "Border" as a name for the Landmark before, but I couldn't make up my mind whether the reference to Border Village was something I wanted to include. At the very least, Border Village comes from a set that really likes Alt-VP, which is cool, and also helps picking up additional cards. Fortifications goes in a similar direction, but something about it just doesn't grab me. Maybe it's the fact that it describes a bunch of different things that already exist, just on a more abstract level (watchtower, wall). I updated every single one of the cards! They all have wording fixes and improvements, and many of them dropped that annoying white bar that was off to the side. I added several new cards and changed some things around, but I'll let you find most of that out for yourselves. The big change was that all the cards now list their creator on the card, so I don't need to worry about giving credit each time I post it. If I changed the card substantiably (cost, vanilla boni, etc.) I added (Modded) to the bottom. Enjoy! It also means that whoever picks it up anywhere online can see who had the idea. Thank you for this, I think it's a great sign to appreciate the creators' work. Or at least, it makes me feel my work is, and that's cool. You did a great job at picking many of those images. Wording complaint: I think that "Den of Theives" should be "Den of Thieves". Unless there is some alternate spelling of "thief" that has eluded me for all these years. 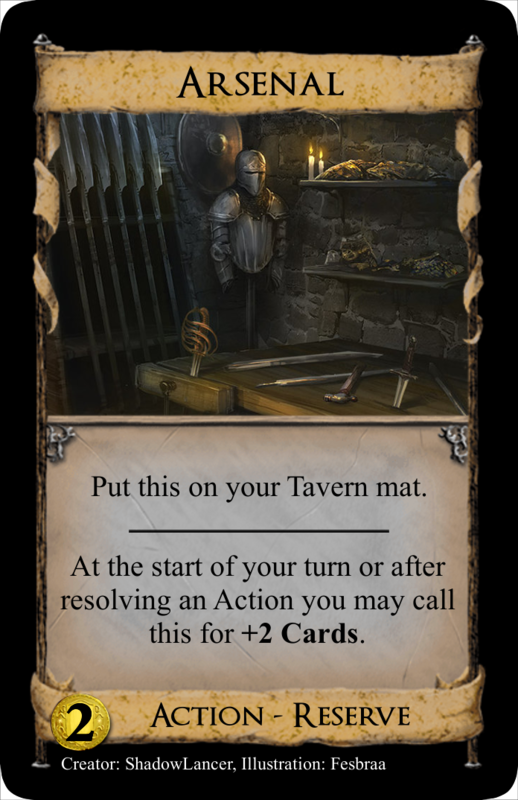 Why does Arsenal still say "if this is on your tavern mat"? It doesn't need that. Huh, never mind. Must have looked at a quote of the old version. Of course, I had to abriveate a few so they could fit, LibraryAdventurer to LA, and A-D-S is Auto-Destruct-Sequence. Sealed Chamber is really OP, Night Patrol is really unfun. Legacy might be able to drop the Siver clause for simplicity, Outbreak is really fun, but maybe better at ? and a Curse terminal isn't that powerful, and the cursing can be a disadvantage. Dying village is kinda weak, + on the 3rd (and 4th?) time might be better. Graveyard is preforming fine I guess, without village support and with Night Patrol it seemed way weaker than it actually is. Highwayman is being dropped, to simmilar to bridge and not unique. Dillema I'll change to + and a buy instead of + . Cabal and Bookseller are performing great, and hoarder was never bought. Maid is really fun and farmer is cool. Bribe will be replaced by Closing Sale, and the other cards section will be more spread out. Holy Order by GeneralRamos! Please see the OP! Warlords and Wizards by 461.weavile! Please see the OP! Greed by Fragasnap! Please see the OP! Ummmm, it's a new mechanic, uh, Attacks that do nothing! Yeah, that's what I meant. It's a cool nerf to the card. I would leave it as is.